Every girl wants the same thing: clear, beautiful, radiant skin. With everything from tinted moisturizers to liquid-to-power formulas to beauty balms and color correcting creams, foundation options are far from limited. First things first: you need to know your skin type to pick the foundation that is perfect for you. Normal skin types tend to have fewer imperfections, no severe sensitivity, smaller pores, and a radiant, smooth complexion. Almost all foundations will work with normal skin, though a liquid will give the best coverage without looking too thick or cakey. Why not try a multitasking beauty balm cream? There are versatile five-in-one formulas that do it all: treat, prime, hydrate, protect, and perfect the skin. Allure suggests Too Faced Tinted Beauty Balm as a "quick pick-me-up for younger skin." This innovative beauty balm cream offers both makeup and skincare benefits in one step. It features SPF 20, strengthens skin's elasticity, and enhances luminosity. Available in five shades, it primes the skin and delivers oil-free hydration for a smooth complexion. Loreal's True Match Super Blendable Makeup has made it onto In Style's "Best Beauty Buys" as an "inexpensive foundation" a whopping eight years in a row. Recommended for all skin types, this pure formula contains no oils, fragrances, or pore-clogging filters, leaving skin beautiful, glowing, and smooth. It contains vitamins A and C, wheat germ, and grapefruit extract to keep skin nourished and healthy. For those with oily skin, symptoms include enlarged pore and a dull or shiny complexion, as well as blackheads, pimples, or other blemishes. Oil-free foundations normally contain extra powder to dry any excess oil on the face. Look for ingredients like silica, which absorb unwanted oil. According to Marie Claire, the Clarins Ever Matte Oil-Free Foundation works wonders. It delivers all-day protection against unwanted shine, sealing in essential moisture while producing a smooth, flawless finish. Available in eight shades, it refines pores while protecting skin from the sun and environmental factors. Most importantly, it leaves your complexion shine-free and healthy-looking. Another great go-to foundation for oily skin is CoverGirl Clean Oil Control, which is formulated with light oil-absorbers to control oil and shine, as well as gentle conditioners to prevent dryness. Highly recommended on beauty blog Lovelish, it is free of oil and fragrance, and gives you a fresh, natural-looking finish. It is available in eight shades, is non-acnegenic, and dermatologically tested. Dry skin types have barely visible pores, red patches, less elasticity, and a dull, rough complexion. It can be quite difficult finding a foundation to hydrate, perfect, and protect without over drying or flaking. Luckily, many foundations now target dry skin in addition to sun damage, tightness, or wrinkles while also providing a natural-looking, smooth finish. Cream foundations are ideal because they contain extra moisturizing properties to keep skin nice and supple. Women and Home suggests Laura Mercier Creme Smooth Foundation. This long-wearing, hydrating formula glides on evenly and feels lightweight and comfortable on skin all day. It provides medium to full coverage and leaves a radiant finish. Available in 12 lustrous shades, it smooths skin while softening the look of fine lines and wrinkles. It is dermatologist-tested, non-comedogenic, and free of silicones and fragrance, making it the perfect remedy for dry skin. Perfect for keeping skin hydrated and supple from dusk 'til dawn, CoverGirl + Olay Tone Rehab Foundation covers discolorations, fine lines, and wrinkles, while hydrating and helping to improve skin tone over time. Available in 15 shades, it combines foundation with a hydrating serum to keep skin nicely nourished. Elle says it is "moisture-packed" and perfect for the winter season when skin becomes dry, flaky, and unmanageable. Combination skin can produce overly-dilated pores, blackheads, and shiny skin. It features skin that tends to be oily along the T-zone and dry on the cheeks, so you need to pick products with dual functions. You likely want to pick oil-free products that still contain moisturizing properties. Free of oil and fragrance and available in over seven shades, ultra-lightweight Estée Lauder Equalizer Smart Makeup Foundation for Combination Skin offers a silky texture that balances oil and moisture to keep skin at its best. It releases hydration when needed and the color stays fresh and true all day long. Paula's Choice's rated this product "best" for combination skin types, stating it "works to keep minor shine in check, but never makes skin look flat or mask-like." According to avid beauty blogger Sara Hassan, Revlon Colorstay Makeup for Combination/Oily Skin provides long-lasting coverage in a lightweight formula. It features Time Release Technology to control oil absorption and shine, leaving a matte, flawless finish. This must-have, oil-free formula looks fresh, feels natural, and comes in 20 shades. Sensitive skin is usually very dry, tends to feel tight, and becomes inflamed and irritated easily. 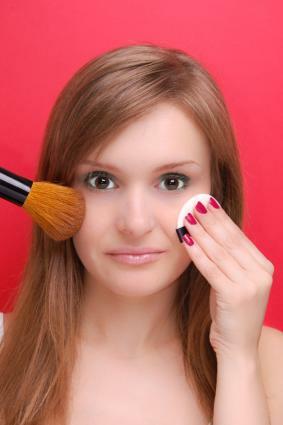 Certain ingredients in makeup can cause sensitive skin to react, leading to acne, rashes, and in some cases, eczema. If you fit into this category, it's lucky for you that brands have dedicated time and effort into creating formulations just for you. Mineral foundations, which can be powder or cream, generally have fewer fillers and preservatives, meaning less irritation. LORAC succeeds in making complexion products that are formulated without irritants, making them soothing to the skin. Free of oil, parabens, and fragrance, LORAC's Natural Performance Foundation is comforting, nourishing, and good for all skin types, especially sensitive skin. It provides medium to full coverage, contains three naturally soothing ingredients, and comes in 10 shades. Feminspire has this on its list of must-haves for sensitive skin, claiming "it goes on very smoothly and doesn't look or feel cakey." Free of fragrances and oil that may be irritating to the skin, Maybelline New Superstay Silky Foundation SPF 12 provides medium to full-coverage for up to 16 hours. This silky, luxurious formulation comes in ten supreme shades that won't rub off and has been dermatologist tested for safety. Real Simple recommends it as "the best medium- to full coverage foundation for sensitive skin. Acne-prone skin tends to exhibits large pores, an oily surface, redness, and blemishes. According to WebMD, all the makeup that you wear ". . .should be non-greasy, non-comedogenic (or non-acnegenic), hypoallergenic, non-irritating, and oil-free." Consequently, mineral powder foundation is probably your best bet. Though mineral powders provide less coverage than other foundation types, they are much less likely to clog your pores or cause flare-ups. Non-irritating, oil-free Clinique Acne Solutions Liquid Makeup neutralizes redness and covers blemishes. It contains medicated ingredients that help treat existing breakouts and prevent future ones. While treating acne and controlling oil, it creates a smooth canvas that is natural-looking and fresh to-the-touch. Available in 12 shades, you'll find this product on Examiner's list of go-to foundations for acne-prone skin. Oil-free and formulated with salicylic acid, a beta hydroxy acid that helps exfoliate the pores so dirt, oil, and bacteria can't build up and lead to breakouts, Neutrogena's Skin Clearing Foundation lets you cover and treat blemishes at the same time. It gives skin a natural look and breathable feel while controlling shine and keeping pores clean. It is formulated with MicroClear® technology to help with existing breakouts and prevent emerging ones from forming. Recommended by Elle and available in 12 shades, it leaves the complexion natural-looking, shine-free, and rejuvenated. Dull or aging skin can show symptoms ranging from a grayish tone, pigmentation spotting, fine lines, wrinkles, and sagging of the skin. Keep aging skin happy, healthy, and youthful-looking by opting for creamy formulas with anti-aging ingredients, such as sunscreen, hyaluronic acid (to reduce dryness), and collagen-boosting peptides. The Today Show featured 22 highly sought-after age-erasing products, and Chanel Lift Lumière Firming and Smoothing Fluid Makeup SPF 15 was the Gold Winner with enthusiastic reviews: "Women raved about its natural, subtle coverage and smooth texture". It provides weightless medium to full coverage and a luminous finish. It is designed to visibly minimizes fine lines and wrinkles as emollients deliver hydration essential for impeccable aging. It gives skin a "lifted" look, controls shine, and comes in eight shades. WebMD lists L'Oréal Paris Visible Lift Serum Absolute SPF 17 as one of the best anti-aging makeup products. It contains anti-aging ingredients to help keep skin looking healthy and youthful. The lightweight formula won't settle into fine lines. It is designed to even skin tone to producing a vibrant, firmer, flawless complexion. Available in 12 shades, this foundation also features sun protection so you'll be free of future damage. You want to mask imperfections, but your foundation needs to match your skin tone while looking natural, radiant, and flawless. Choose a formula recommended for your skin type and select a foundation shade that's a perfect match for your skin. Wearing the right foundation will not only make you look beautiful, it will give you a new found sense of confidence. So do your research, test out products, and be the very best possible version of you.